The Rambling Infidel: Should The UK Bomb Syria? David Cameron has laid out his plan to extend operations against ISIS from Iraq into Syria and will hold a vote in Parliament on Wednesday to decide whether her Majesty's armed forces should intervene in Syria to fight ISIS by way of airstrikes. Among other things is requring a "poltical transition" in Syria to bring about an end to the civil war and to increase humanitarian aid. A significant part of the proposal there is an estimated 70,000 moderate (for want of a better term) rebels who do not belong to extremist groups that can help in fighting ISIS. Already, many people are skeptical of this number and will ask "who are these people?" While others like Robert Fisk will claim that these "moderates" don't exist and are "ghost soldiers" and Cameron's own Conservative MP's labelled these figures as "magical". The brilliant Charles Lister explains here who these people are. "Many of the groups who fall within both these categories are armed factions the Islamist-averse United States’ CIA has already ‘vetted’ and assessed as ‘moderate’ enough to receive lethal assistance. Some others are recognised by Syrians as ‘mainstream’ members of the revolution – some moderately Islamic – and crucially, as being strongly rooted within local societies. 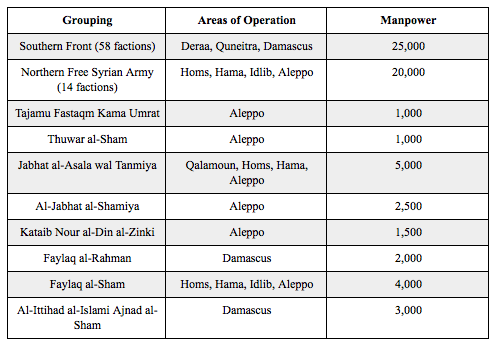 Combined, these factions likely represent roughly 65,000 fighters." 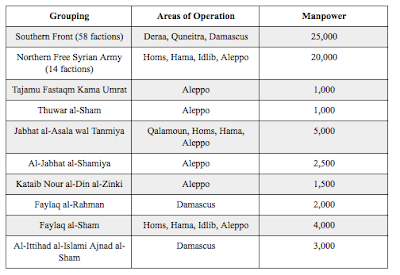 "Making a total of 75,000 fighters, these 105-110 factions broadly represent what one could today label as ‘moderate’ in Syria’s context. This means they are explicitly nationalist in terms of their strategic vision; they are local in terms of their membership; and they seek to return to Syria’s historical status as a harmonious multi-sectarian nation in which all ethnicities, sects and genders enjoy an equal status before the law and state. They remain focused on fighting the Assad regime, however, as it represents a more immediate priority for most, in terms of self-protection, the defence of civilian populations and of course, pursuing the revolution’s ultimate objective. Beyond these factions, it becomes more complicated." This should answer the question of those who snidely claim "Where are the moderates?". Well here they are, all that is needed is for them to be organised and weaponized. Predictably, the "anti-war" movement mobilized, #DontBombSyria has been trending on Twitter for the past couple of days and'Stop The War' organised a protest to oppose the potential British intervention in Syria with their lame chants and even lamer speakers such as Tariq Ali and George Galloway. The Ayatollahs of the regressive left. Just goes to show how much of a sham this "rally" was when they have someone like Galloway who has a track record in supporting tyrants and thugs like Saddam Hussein, Bashar Al-Assad, the Mullahs in Iran etc. Both Galloway and Ali's speeches were absolutely terrible not to mention quite bland with the same old regressive left cliches. My favorite part was when Galloway was on stage and he said Turkey is the "principle ally of ISIS and Al-Qaeda" expecting a rapturous response. Instead he recieved relative silence and even a few quiet boos because what he said is so untrue. Talk about an anti-climax. Tariq Ali's speech was essentially that the UK should not intervene in Syria at all. Though he couldn't make that argument without taking a cheap shot at Hilary Benn. He also called Guardian columnist Jonathan Freedland a "Blairite" though he didn't say Jonathan's name explicitly and he fantastically equated the wars in the Middle East to the media in Britain criticising Jeremy Corbyn (yeah, I know amazing). I hope Tariq realises this is not about Jeremy Corbyn, no matter which way you want to spin it. This is about Syria and the welfare of the Syrian people. The sufffering of Syria should not be used as a proxy for domestic political squabbling. Personally, I find that gross. But there are a couple of statements Tariq said in his speech that I want to scrutinise more in detail. “the Russians have gone in to fight ISIS and they are fighting ISIS, there’s no doubt about it"
This is a half-truth. 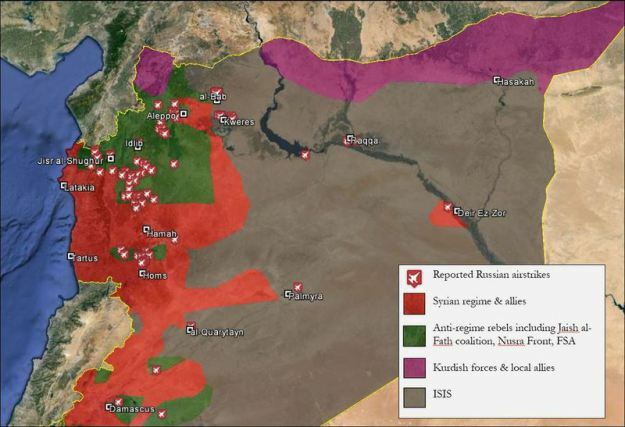 While it is true that the Russians are bombing ISIS positions in Syria especially after the Sinai plane bombing. However, what he doesn't mention is the fact that the overwhelming majority of Russian bombings in Syria have been against anti-regime rebels like FSA, Ahar Al-Sham and Jaysh Al-Fatah. I will be charitable to Tariq. I'm not sure he is actually advocating that we should ally with Assad, Iran and Russia to fight ISIS but I believe he is saying that if Cameron is serious about fighting ISIS (which he doesn't believe to be the case) then logically he should work with Assad and Putin because they are "fighting ISIS". However, as pointed out previously Russia is more concerned about keeping the Assad regime alive and fighting other rebel groups that are a more direct threat to the regime than ISIS is. Furthermore, entering into a grand alliance with Russian imperialism in Syria would actually help ISIS as it would validate their conspiracy theory that there is a Crusader-Zionist-Rafidah alliance to destroy Sunni Islam which in turn means Sunni Arabs (ISIS' main constituent) are more likely to support ISIS because the only alternative is to be ruled by Assad and Shia militias who has committed many atrocities against them. With this being the case Tariq Ali's argument is null and void because Assad and Putin are a huge part of the problem not the solution. He also talks about how the war in Syria is between the "Assad regime and ISIS and all the other Jihadi groups". How people get away with this demagogy I don't know, Tariq defines Assad's opposition as solely ISIS and Al-Qaeda thereby all of the rebel groups are Jihadists and says it is "nonsense" that there is a moderate third way. As I've mentioned previously we do know that there is a moderate third way, if that wasn't enough here is some more. This borderline Islamophobic rhetoric is very dangerous as it delegitimizes the Syrian revolution and makes people in the west view Syria through a purely war on terror point of view where they see the revolution solely as a grand Islamic Jihad with ISIS leading the charge. But the truth is more complicated than that. In essence, this protest was all about telling David Cameron not to bomb Syria while having nothing to say of Assad and Putin's airforces that are bombing Syria and killing many innocent civilians everyday. Shameful hypocrisy. I am not someone who obessess too much about demographics but what I found interesting when examaning the pictures of the rally one could'nt help but notice that the crowd was mostly white and probably privileged, middle class, leftists who really are not interested in taking a morally serious postion but want to posture and virtue signal behind silly jingles. I skimmed through the photos with a fine toothcomb and I seriously had to play the game of "spot the hijab" and I found none. Seems like hijabis were only useful for the Iraq war but if they give an opinion on Syria that you find uncomfortble. Well...."Screw em, we don't need them". There wasn't even any Pan-Islamists (notoriously anti-western) present at the demonstration because even they could see this as the joke and sham it was. So much for the "left-muslim" alliance. I would reccommend to the folks at Stop The War that if they really care about Syria why not listen to what Syrians themselves have to say? But as we know Stop The War has not listened to Syrians and has actually prevented them from speaking. They obviously do this as Syrians would shatter their rigid worldview since they say truths that make the "anti-war" left very uncomfortable. It is about time to say that Stop The War has lost all crediblity whenever they speak on issues such as this. As Christopher Hitchens once pointed out. If the likes of them had their way then Saddam Hussein would still own and occupy Kuwait, Milosevic would have made Bosnia a part of his "Greater Serbia" project, The Taliban would still be in power in Afghanistan with Al-Qaeda as their guests. Moreover, ISIS would've committed an act of genocide on Mount Sinjar against the Yazidi population. And now they have pretty much gotten their way in Syria where they oppose all forms of interventionism against the Assad regime. So, to borrow the language of intersectional politics, these white, privileged leftists should stop speaking over Syrian Arabs and actually listen to them. Since Stop The War is not interested in that, it looks like I'll have to do it for them. If you actually listen to Syrians and Syrian activists. Generally, they will say that Assad is the main problem in Syria, not ISIS since Assad's forces is responsible for 95% of civilian deaths in Syria since 2011 and the regime has tortured and murdered people on an industrial scale in it's dungeons. Secondly, they also want the protection of civilians from barrel bombs and airstrikes through a no bombing zone. This will also empower moderate rebels to fight ISIS as they won't have to face the scourge of Assad's barrel bombs and it will hopefully lessen the creation of refugees. In conclusion, I do think that in fighting ISIS it is misguided to just focus on Iraqi areas controlled by ISIS and ignore the Syrian ones especially as ISIS' revenue streams, supply lines and command structure are located in Syria which allows ISIS to use its Syrian territory for strategic depth. So in that sense I agree with Cameron. However, I don't think airstrikes alone will suddenly bring about the demise of ISIS, it will only add to the cumulative damage ISIS has been recieving for the past year by other air forces already bombing in Syria mainly The United States. In other words, airstrikes are not really going to do much, what is required is a ground force component (preferably local) to actually take territory from away from ISIS. In my opinion, the best way to defeat ISIS is to support the forces that are in the best position to defeat it, namely the at least 70,000 Syrian rebel forces referenced by David Cameron that have for the last four years been fighting the Assad regime, Iran, Hezbollah, and ISIS. More importantly, we have to focus on the fact that the Assad regime is responsible for the most civilian deaths and is the main source of the massive civilian displacement. ISIS will never see the day of defeat as long as the Assad regime remains. We have to do whatever is necessary to support these forces. If the Prime Minister is really concerned with fighting ISIS , why hasn't he done more to arm Syrian rebel forces and why hasn't he pressured the US to lift its criminal blockade on the rebel forces receiving the anti-craft weaponry necessary to take on Assad's air force and protect civilian life from the Assad regime's attacks on civilian areas? My position is this. I am all for fighting ISIS and resisting the forces of Jihadism but we need to do it in a smart and effective manner. Airstrikes alone is pointless as it will not hasten the inevitable destruction of ISIS unless you have a viable ground force alongside them. But in order to get the moderate Sunni Arabs on your side you have to have a strategy that stops Assad bombing them and one that will put an end to Assad's rule in Syria. 60,000 of the 70,000 moderate rebels are fighting in fronts where they are fighting the regime. Do you seriously think they are going to switch fronts and turn their guns towards ISIS because David Cameron said so? The debate in the UK should be about how to find a solution to the problem of ISIS and Assad not simply throw bombs and expect a miracle to happen. The ultimate aim should be to complete the Syrian revolution and allow Syrians to emancipate themselves from the clutches of Bashar Al-Assad and Baathism, once and for all.